The Association of Fundraising Professionals Topeka Area Chapter wants you to succeed in your fundraising career. 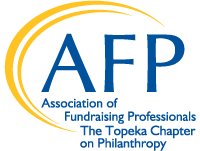 Being a member of the AFP Topeka Chapter is an excellent way to connect with colleagues, engage in creative thinking, network with new friends and achieve great results in their work. We meet monthly for professional development programs including webinars, discussion panels and extended length skill building sessions. AFP Topeka is your link to professional networking and educational programs for advanced executives, mid-career professionals, and those new to the field. Help make AFP Topeka work for you! Contact us at afptopekachapter@gmail.com to learn more and get involved! Please check out our 2019 program schedule, volunteer opportunities and get to know your Chapter leaders. If you're not a member, join today and be connected!